I'm not here to badmouth software developers. I'm here to help them make their software worthy of your money. For those who refuse to listen to good advice I'm here to warn the consumer when software isn't what the box advertises it to be. I have tested a lot of sim software and written a lot of reviews. I've made software developers very angry with me just because I tell the truth. I've had VP's in charge of product development literally in tears because I told them their flight sim software wouldn't "fly." It didn't. They knew I was telling them the truth and told me they had tons of reports in their E-mail boxes all ready. The following year they were packaging their junk software with other junk software and practically giving it away in the software departments of major chain stores. The catch is this, if they had listen to me to start with they could have fixed their software and made it worth the money they charged for it. Who was that particular software company? It was Nova Logic of course and the sim game was their F-22 Lighting. 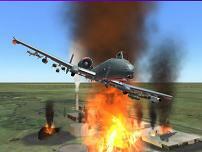 Lock-On Modern Air Combat is without question the best flight sim I have tested since Jane's went out of business. I have a lot to say for it and that's where I'll start. If a sim game passes my first set of tests then I will give it my all to test every aspect of the sim game. I was a programer in the past, my wife still is a computer programer. I know what programs can and should do. I also know that a GREAT deal of work is involved in a good computer simulation. I know bugs are always a problem but they can be fixed if the programer or development team is listening to the customers. I am a pilot and I know how a flight sim should work. 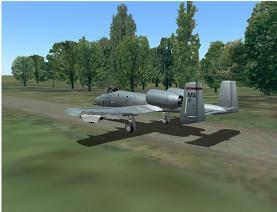 I am not interested in those "look-alike" software packages like X-Plane that pretend to be something they are not. If a sim customer has no clue what a flight sim should act like then let them get inferior software, I'm sure they will be happy as long as they don't know any better. 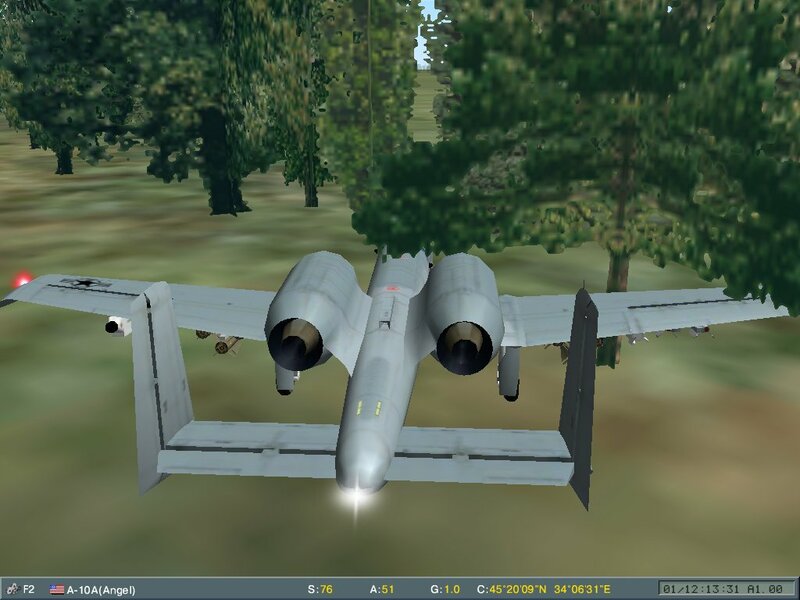 The real flight sim software isn't that easy to learn and this is why most game companies have either gone to first person shooter games or really inferior flight Sims. Ordinary people just don't have what it takes to be a real pilot. A good flight sim will challenge anyone's abilities to learn. My wife is a brilliant software programer and boss over a team of programers where she works. At first when she would fly the Lock On sim she thought she was doing great just to crash on the runway. She's learning though and now she's getting better at landings. I try to teach her that the concept of landing isn't just not to crash but also to be able to use the airplane again. ;-) One day I hope to teach her how to blow things up. I need a wingman real bad and right now she's the only other person around here who can even land it without crashing. Passed all of my first tests for a flight sim. Because of this I have decided to give it the time and attention it deserves. Meaning I'm not done testing it yet. :-) But I have some good things and some bad things to report. Looks good. Sounds Good. Feels Good. Has good graphics and sound effects. It has a powerful mission builder. It has on line updates. It has a support group on line. It has multiplayer mode that actually works despite the fact we never could get the LAN settings to run a game LAN. But we did get game to MP over the LAN by using the Internet settings. It even has something I have never before seen in a simulation game. It has the ability to record your flight and even make a video of your flight. It also has aerobatic features. In fact there is a virtual Thunderbirds team that has made an amazing video for your viewing pleasure. Is a huge pleasure. These two jets are so much fun I've spent hours just flying across the map, taking off here and landing there and going again. I fly up between 30,000-40,000 feet, hit the F3 and watch the con trail as the jets zooms past my viewpoint. 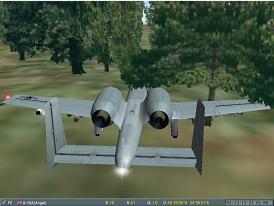 I've spent hours just flying aerobatics over a runway in both the A-10 and the F-15c. Even with a very high end computer eventually the game will lock up if you don't keep the game graphic settings on low. The higher the graphic settings the sooner the game will lock up. I have two copies of the game on two different computers. The laptop is a 3.2 ghz and the other PC is a 2.08 ghz. The graphics run smoother on the 2.08 but the game locks up much sooner even with settings on medium. 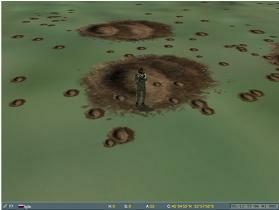 The more that's going on in the mission the sooner the game will lock up on both computers but with the very same settings it runs longer on the 3.2 ghz laptop. I had read messages about how bad the AI was on the player's wingmen. After spending God only knows how many hours flying missions with the A-10 I can't believe how stupid the wingmen are even when they are set to excellent. I have told them to attack the main mission only to have them fly away to find a SAM and get killed. I have told them to kill the SAMS only to have them, fly away over a SAM and get killed. I've watched them fly away to God only knows where while saying they were going SEAD when the enemy was right there in front of us. I've told them to attack the SAMs only to have them turn on the main mission and ignore the SAMs and get killed. I wish it had a command so I could tell them to stay out of harm's way and just circle until I call for them. Perhaps I could keep them alive until I could take out the anti-aircraft defense systems. 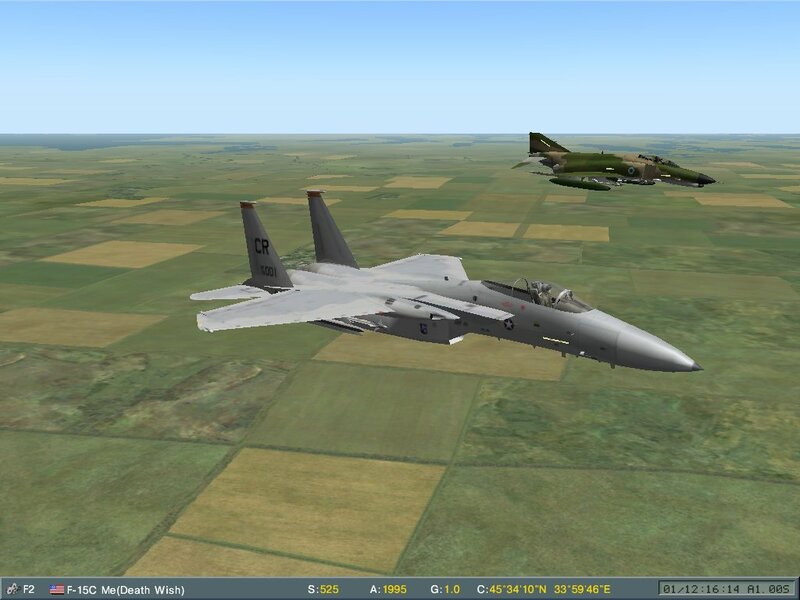 Wingmen in the F-15c seem to have a much better A.I. They still get shot down but at least the follow orders better. Also known as unguided rockets. In the A-10 I don't have this figured out yet but I can shoot a tank or vehicle with the hydras/FFR's point blank and 95% of the time watch them drive away. I can shoot them from 4 miles away with the Gatling in the nose of the A-10 and kill a truck, BMP or soft target fairly easy, providing I hit it. I love that big gun. 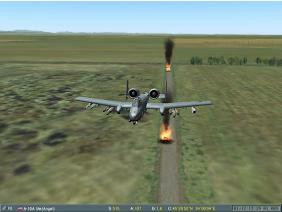 I hate those stupid rockets on the A-10. Just the opposite with the SU-25 "Frogfoot." With the FFR's in it I can accurately destroy targets up to 4 miles away. Understand right to start with everything in the Russian jets is in Russian. The bitching Betty, instrumentation, everything is in Russian and metric. Your speeds, your altitudes and everything that an American would depend upon will not appear the same in a Russian jet. This gives an American or English speaking pilot an instant handicap when flying the Russian jets. I've always considered the Russians to be very intelligent and resourceful people. Russian jets have some awesome weapons. Their navigation equipment and radar are second to none. 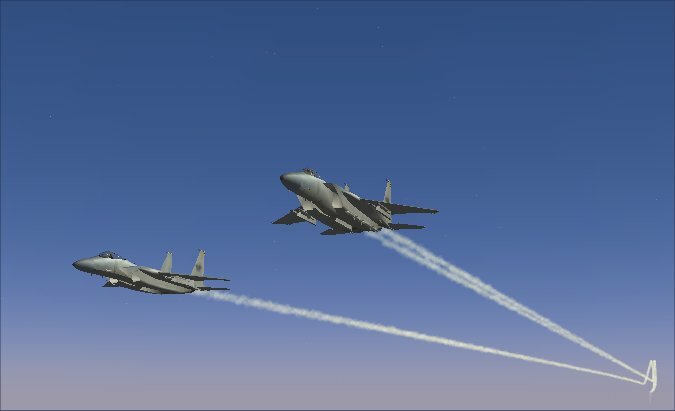 Now that I've said that I have a few things to say about their fighter jets, based on information I get from this sim game. I don't know if this is a sim game problem or if the jets actually fly and act like this. 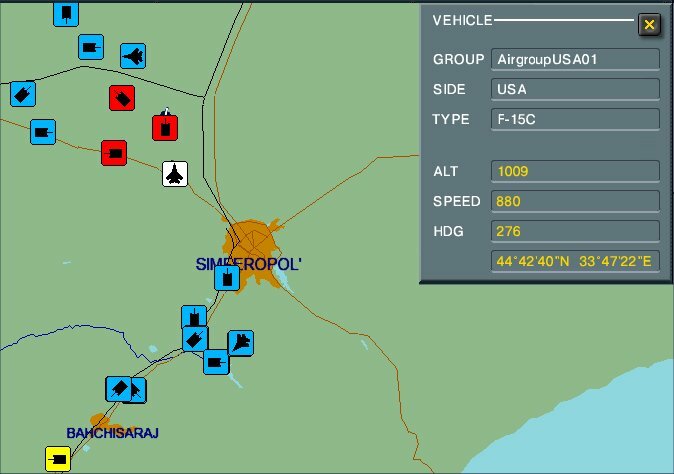 The Migs and Su's in this game with the exception of the Su-25 are wicked bad on the flat out. With a good pilot the enemy is in serious trouble. If they get a lock on the F-15C in the distance he's in serious trouble. The Russians have missiles that have greater range than the F-15C. If the Russian gets off the first shot the F-15C pilot is not going to be thinking much about firing a rocket, he's going to be thinking how to loose that missile headed his way. Still if I have a few seconds I will try to get off at least one round just in case I do manage to loose his missile, because if he's still around he's going to shoot at me again and I might not be as lucky next time. As far as flying the Russian jets, they are a lead sled in a turning dog-fight. They always seem to fly tail heavy especially at lower speeds. If you get into a turning fight with one it looses speed quickly even with full after burners on. Chances are it will go into a flat spin from which you can not recover. In this sim game for some reason the AI pilots don't seem to have much of a problem with this, but if the player flys the Russian jet and gets into a turning dog fight he's going to be in trouble. The Russian pilot's best chance is to get in the first shots and hope to stay out of a turning dog fight. When doing my research on this game I watched an air show featuring an SU-33. The only thing it did was it's world famous Cobra maneuver. Quite impressive at an air show but not at all practical in a dog fight. While he's doing his Cobra maneuver someone else is going to be shooting him down. 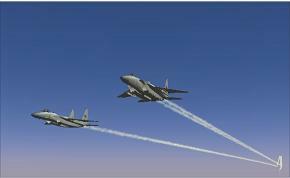 In this sim game by the time you slow down that slow the jet's going to go tail heaven and likely to go flat spin on you. All this leads me to believe that perhaps the fault is in the sim game Russian jets more than it is the actual Russian jets. 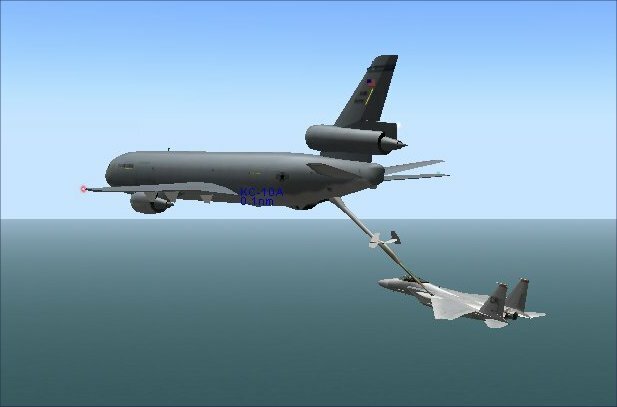 Flight Sims Must Pass the First Set of Tests. It must run and work long enough to play a mission without locking up my computer. Updates must be available on line. The software development team must listen to the customers. The company distributing the software must support the software. It must act, sound and "feel" like a real aircraft. It must have programmable controls and work with my joysticks. It must have varied levels of game and graphic settings. I like a good fully functional mission builder for this kind of flight simulation game. Lock-On has quite a few aircraft and ground vehicles but will only allow the user to fly 2 US aircraft and 5 Russian aircraft and 1 German. Let's face it. A Mig 29 as far as a sim gamer is concerned is a Mig 29 anyway you cut it. And the SU's except for the SU-25 are all Migs to. They look alike they fly very similar and Well if you ask me it was a waste of the sim game team's time to have so many jets that are so very much alike. I think they need more US aircraft for us to fly! How about you? They need the main US aircraft and two brand new ones. You can land on the roads and highways, drive down them and admire the impressive work that has gone into the scenery. Just do not drive off the road or you will sink and get stuck. After leaving this jet on the runway when I jumped into another jet, this jet took off across the country and taxied many miles through trees, buildings, fences, rivers in order to get to its last waypoint. I don't know about you but I do not think that was realistic. 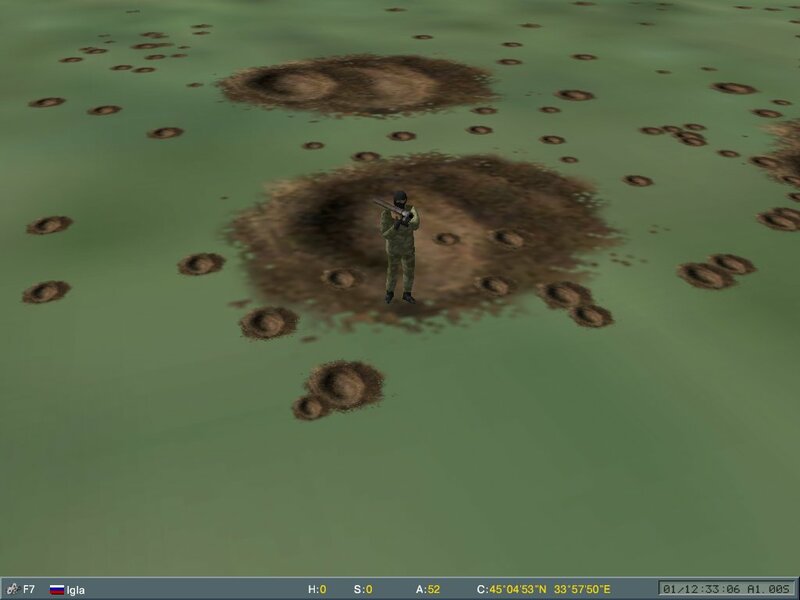 It's very rare in this game, but this soldier was shot, bombed, shot again, bombed again and then took a direct hit from a Maverick and still he stood his ground and shot back. This soldier must be Superman! Again not realistic. Something happened to my text editor. Now when I try to edit the text in the text box the text flashes in the editor then vanishes. It's not there anymore to be edited. So I'm taking a break at this point on this review. I reported it and they said it is a bug in the program and that in the next version the bug has been fixed. For now I will open a new text box for text and hope it doesn't vanish to. I realize I'm finding a lot of problems with this sim game but believe me, all the good things it has going for it makes a huge difference and shows the game is headed in the right direction. If they fix the problems I've found and listed on this page the game will be improved GREATLY. I had some complaints the other day about scoring when I knew I had shot down 4 Migs and only got credit for 1. A little while ago I got credit for shooting down 10 Migs and I only had 8 rockets and missed with one of those. I did not use guns on that mission. Something is wrong with the scoring system in this game. Nearly every time I use the "A" for auto pilot when I turn it off something bad has happened to my airplane. It becomes hard to control, it tips left and right, it literally teeters back and forth like it's about to tip over. Pressing <control> "T" to kick out any trim tabs have no effect on the problems this "A" (autopilot) creates for the game. "H" altitude hold does not have this problem and what it does can be corrected with a <control> "T" command. Sometimes the airplanes including mine will vanish from the map and not return during a mission. This leaves a pilot wondering where they are and what's going on. I always manage to get back to my airport though usually by following the waypoints. I highly recommend Lock On Modern Air Combat flight simulation game based on the fact it has the most realistic simulated airodynamics since Microsoft Flight Simulator. I know it has a lot of things that need to be fixed but it is a playable game challenging and fun. This review is an on-going project. Check back later for updates to this page. Thank you for visiting. Please tell your friends about this page. Get up there around 30,000 ft. and cruse like crazy! Try something challenging. Try in flight refueling. Bug problem, after refueling I can't get control of my engines again. CRASH! See this tank image on the map? Guess what, it's not a tank it's an F15C! You can clearly see this is the item selected and you can clearly see the description of the selected item right here.